South Plains had no answer for Tamara Seda. Seward’s 6’4" post owned the paint with 30 points and six rebounds in Seward’s 84-56 win over the South Plains Lady Texans in the Green House Friday night. 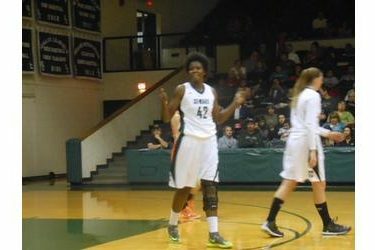 South Plains’ tallest player is 5’10". Rebekah Hatchard scored 17 on 7-10 shooting on night one of the Billy’s/Days Inn Classic. Kyndal Davis added 13 points and seven rebounds and Brianna Scott had nine assists. Seward led 50-29 at the half. The Lady Saints shot 52 percent from the field and forced 27 Lady Texan turnovers. Seward is 4-0 and SPC is 1-2. Seward faces 5-2 Midland at 6 tonight on 1270 and kscbnews.net. Midland lost to Hutchinson 76-50 Friday afternoon in Liberal.